Chicken-fried or country-fried steak is enjoyed everywhere in the U.S., but especially in the Southern and Southwestern states. It is usually made with round steak, tenderized then dipped in an egg and milk mixture, then dredged in seasoned flour or breadcrumbs. The coated steak is then fried in hot fat until the coating is crispy and browned, much like fried chicken. Country-fried steak can also be made by coating the tenderized steaks with seasoned flour or crumbs. With chicken-fried steak, a milk gravy is often made and served with the steak, along with mashed potatoes. Country-fried steak is most often served with a brown gravy. However, this is not always the case, as you can see in various recipes. Smothered steak, another version, is fried then simmered in gravy, which makes a tougher cut of meat even more tender. These fried steaks bear a resemblance to Wienerschnitzel, a dish which is usually made with veal or pork. According to The Dictionary of American Food and Drink by John Mariani, the term "chicken-fried steak" first appeared in print in the year 1952. It has long been a favorite dish in the South, Midwest, and the Southwest United States. 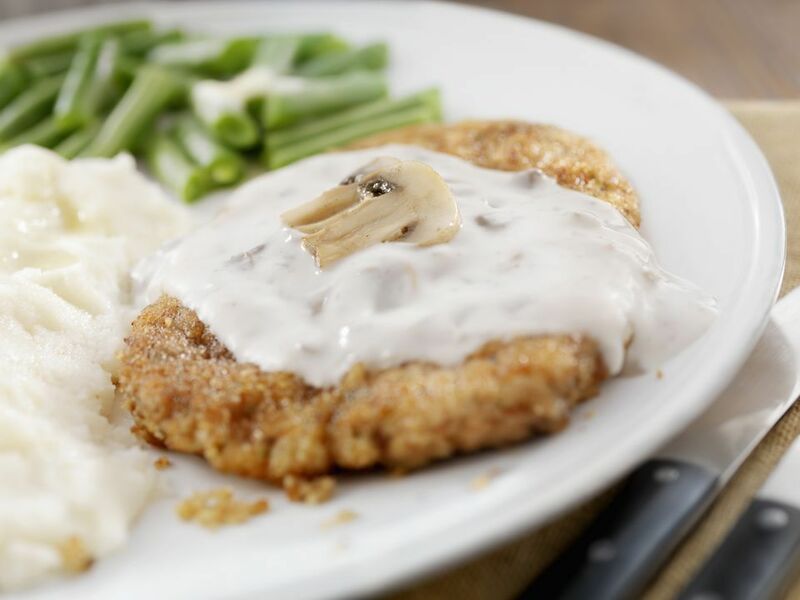 This Southern chicken-fried steak is made with round steak or sirloin tip steak. Milk or light cream along with pan drippings and make a tasty gravy. A dash of Tabasco and cayenne add some zest. You can enjoy it as an everyday family meal, served with mashed potatoes, green beans, and a green salad. This country-fried steak with brown gravy keeps to the definition of being served with brown gravy you make from the pan drippings and chicken stock. The coating is less crisp and, in this recipe, the steaks are smothered in the gravy to finish cooking them and give them more flavor. Caramelized onions and beef bouillon flavor make up the gravy for these country-fried steaks with caramelized onion gravy. It's great to make when sweet onions are in season. Enjoy it served with mashed potatoes or rice. When you need a super quick and easy weeknight dinner, this gravy recipe uses only two ingredients—cream of mushroom soup and milk. You can't go wrong. Tenderized cube steaks are dipped in buttermilk and cracker crumbs to make this easy country-fried cube steak with mushroom gravy. Cube steak gets its name from the indentations made by the tenderizer mallet. You can either buy cube steak or make it yourself from top round or top sirloin. This recipe also uses cube steak, either bought at the store or made yourself with a mallet and a good cut of meat. Serve Annie's Texas chicken-fried steaks with biscuits, gravy, and mashed potatoes. You can buy prepared brown gravy or mushroom gravy if you don't want to take the step to make your own. Add your family's favorite vegetables for a delicious everyday meal. 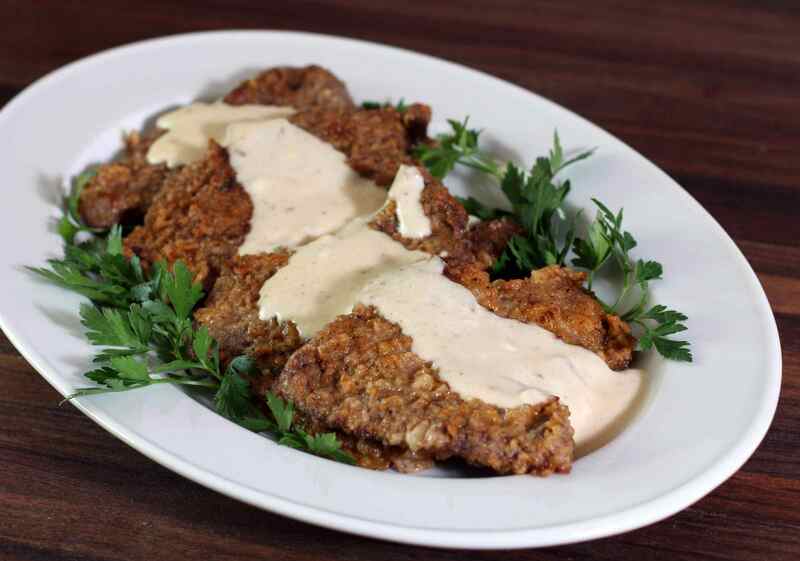 Here's another Cyndi's country-fried steak with gravy recipe with creamy milk gravy. These steaks aren't just for dinner, they make an excellent breakfast as well. Serve them for breakfast or brunch with eggs, toast, biscuits, home fries, or hash browns for a hearty meal.